Famous people born on JUNE 4, are Gemini who people say are sociable, wise, but a bit demanding. They like being busy as they are naturally enthusiastic about life. Some say that they are audacious and unapproachable. This couldn’t be further from the truth. The June 4 famous celebrities have great compassion for people and an excellent sense of humor. They tend to gather relationships all over the world. The perfect soul mate will undoubtedly be provocative yet romantic. This couple will tour the world in a single night as their minds will stir up some interesting fantasies. Famous people born on June 4 believe in love at first sight. Sometimes, they “see” too many though. Just as they are able to fall in love, they should know that lover may not return their feelings. While at work they are very accomplished and are reliable and steadfast. They show restraint here that otherwise their friends didn’t know they were capable of. 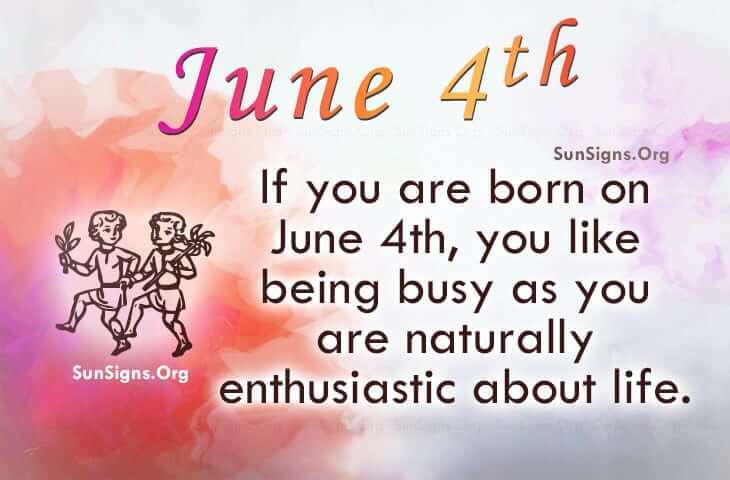 Famous people born on June 4th, can be a ray of sunshine and it is likely that they will have an impact on how other folks feel. A Gemini will likely have excellent communication skills. They can be geeky or artistic. They may have had more lovers than expected.